Regular readers would know that the Nissan Livina range (Livina, Grand Livina, X-Gear) has been facelifted. Pics of the refreshed Livina from China were leaked in December last year, before we ourselves snapped a disguised unit testing in Malaysia. No hiding now, as we’ve got live pics from Auto Shanghai 2013. On the exterior, the refreshed MPV gets a revised front fascia. Compared to the current Livina, the headlamps are now in a sharper triangular shape, while the chrome grille is in a sweeping V-shape with a flat base. The rear end features long tail lamps that eat into the tailgate. Inside, it appears that the Livina facelift retains the familiar dashboard layout and design, but with a new design steering wheel and chrome borders for the dial housings. The 2-DIN head unit looks like the usual Nissan item at a glance, but is a fresh design. Like most cars in China, there’s a sunroof. The white car you see here is the standard five-seater Livina, not the seven-seater Grand Livina we’re familiar with. The green one is a more rugged-looking “SUV-styled” variant of this shorter version called X-Gear in Malaysia. Compared to the standard car, the X-Gear gets a unique grille treatment and a black base for the tailgate Nissan badge. got rear ac vent? from photo looks like there is no rear ac vent. Nissan Livina is still facelift. Boring…. 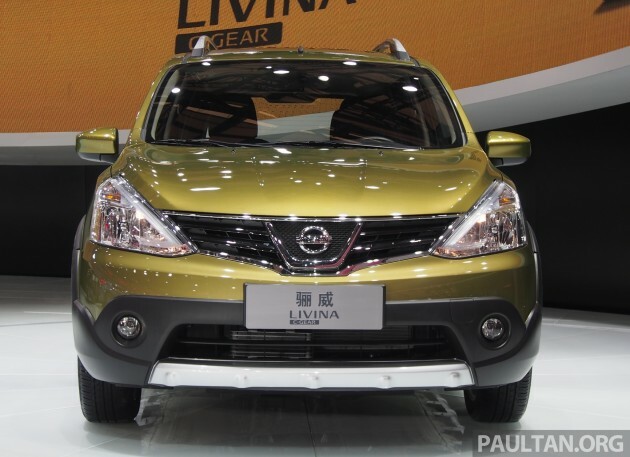 Expect the All-New Nissan Note 2013/14 (E12) will be as Nissan Livina 2014/15 in China. Good cars have good fits and finishes, with minimal rattling sounds if any, especially in the first 5 years. Own a good car and you will know, or ask your friends. another legacy from TC !!! Livina another heritage to follow..
Rear light look bit similar to Golf MK7. Damn…. I like the motherly look of the current version even though is as bland as a hospital wall. The facelift not only lost that look by becoming more macho(more….not outright manly), but its still as bland as my clinic wall. With 50/50 split 3rd row seat?